South America is a captivating destination but with such a vast geographical spread, it can be hard to know where to start in planning a trip to this intriguing continent. If you’re looking to tick off a “bucket list” moment in your life, Peru is the place to start. Voted in 2007 as one of the New Wonders of the World, Peru’s Machu Picchu must be on your travel “to do list” if you want to experience something truly remarkable in your lifetime. The Inca Empire miraculously engineered this site, often known as “the lost city of the Inca’s” in the 15th Century. It was abandoned by the locals at the time of Spanish invasion and was not found until 1911, meaning the site is relatively well preserved. It has also been restored over the hundred years since discovery. The surreal natural beauty and views at this sacred site will leave you breathless and elated. Cavernous lush tropical valleys intercept with the main focal points beyond the ancient township of Machu Picchu, the two mountains, Old Mountain (Machu Picchu) and Young Mountain (Huayna Picchu), both of which appear to spear up towards the heavens. Set at a high elevation of 2,430 metres above sea level, on a mystical mountain ridge in lush jungle, Machu Picchu makes a monumental impression on all who visit. Spellbound and awestruck, you will discover that the advancement of the Inca Empire is truly evident here. Feats of human invention in architecture, hydraulic engineering, terrace construction, spiritual devotion and nature worship leap out at you at every turn. The friendly and quaint town of Cusco is a great launching pad for Machu Picchu and I highly recommend staying here at least two nights after arriving, especially if you’re flying into the city. Spending some time here helps adjust to the altitude. Cusco at 3400m above sea level is actually at a higher elevation than Machu Picchu. 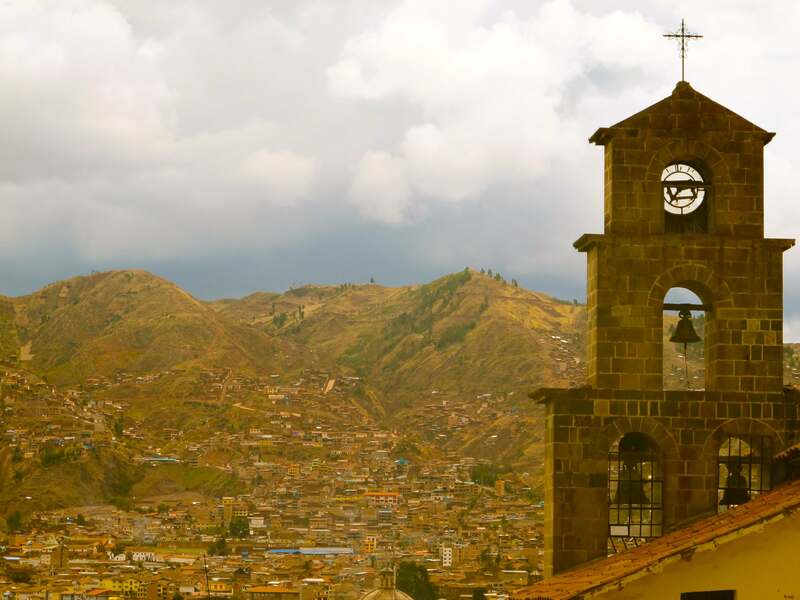 Regardless of the need to take the time to adjust to the altitude, Cusco is simply a cool place to hang out and time permitting you could easily spend four nights here or more. An UNESCO Heritage Site, set in the Peruvian highlands, Cusco was once the capital of the Inca Empire. A few hours flight from Lima, Cusco is sometimes fondly known as Peru’s cuisine and historical capital. Buzzing with travellers, the nucleus of Cusco is Plaza de Armas. This lively square and the surrounding streets burst with shops, bars, and restaurants known for serving the best of Peruvian Andes cuisine. If you are an adventurous eater you will want to try the roasted Guinea Pig for which Cusco is famous. There are a plethora of top eateries offering authentic Peruvian to Italian, French, Organic Vegetarian and café style “comfort” food. As for drinks, on a sobering front, the local coca leaf tea is not only delicious, it is a great remedy for altitude sickness. In the evening, you will want to try the renowned Peruvian brandy, Pisco, at one of the copious bars, which serve a range of Pisco-inspired concoctions. Cusco is rich with history and the highlights include the Inca museum and the centrally located Baroque style churches and cathedrals, most of which are a hybrid of the Inca original foundations with the modernisation and religious influence of the Spanish conquistadors. A slight walk up the hill from Plaza de Armas is the arty San Blas neighbourhood, which offer some lovely elevated views of Cusco and pleasant meanders through cobbled streets, dotted with café’s, restaurants and craftspeople at work in their shops. In nearby countryside there are a range of different Inca archaeological sights such as Saqsaywaman, Q’enqo, Pukapukara and Tambomachay where you can reflect on the miraculous ingenuity of this remarkable culture. The Inca’s forward thinking and long-term vision of creating infrastructure for accommodation, cultivation and spiritual appreciation were executed over many generations. No such thing as short-term politics here! 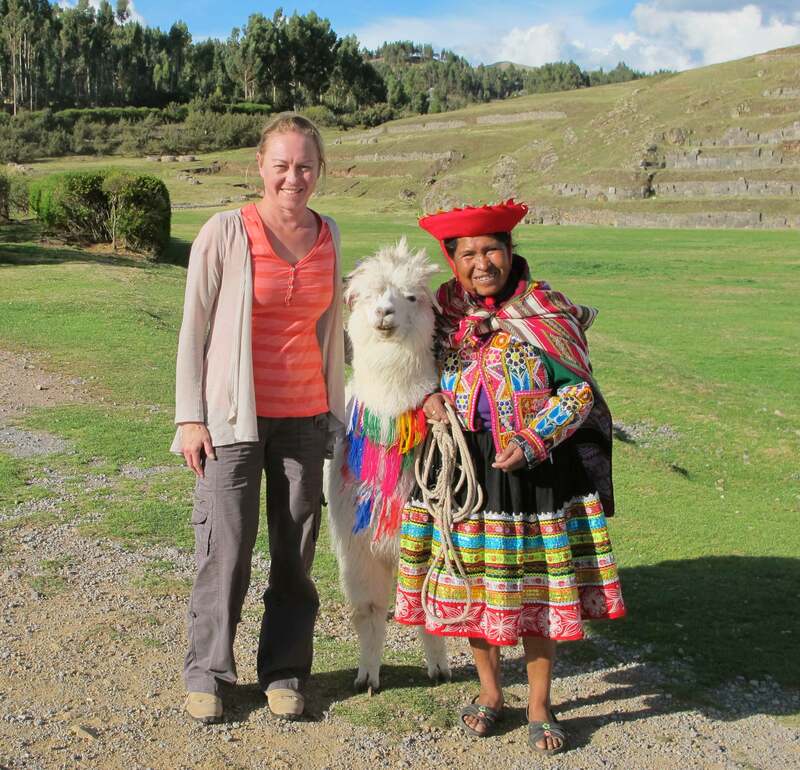 The region is also famous for llamas and alpacas, which you will see both in the wild and on the streets of Cusco, usually in tow with local women and babies on the scout for photo opportunities. Cusco and nearby towns are a great place to stock up on winter woollies such as baby alpaca sweaters and obtain other good deals in silver, gold, stone and woodcarvings. On the outskirts of Cusco are the small towns of the Sacred Valley such as Pisac, Moray, Chinchero and Ollantaytambo, where you can visit more Inca sites and craft markets. Aside from archaeological sites, the area is lush with agricultural landscapes. Aguas Calientes, the base town of Machu Picchu, is definitely worth staying for a night or two, before or after your Machu Picchu experience. Full of restaurants, bars, shops and accommodation, you’ll no doubt meet lots of other travellers who are going to or coming from Machu Picchu. There are hot springs just a short walk from the centre of town, which may come in handy to soak your weary legs after all the walking you have no doubt been doing. So after Machu Picchu, the Sacred Valley and its ruins, what else makes Peru a bucket list destination? Peru has the second largest amount of Amazon rainforest in South America, after Brazil. One of the best entry points to the Peruvian rainforests is Puerto Maldonado, near the Bolivian border. With short and daily flights from Cusco, it makes ticking off 'Seeing the Amazon Rainforest' on your bucket list, achievable and affordable. Travel by river deep into the dense jungle to experience a thriving ecosystem of fauna and flora, and hopefully you will get to see the South American Macaw bird. Puno, also near the border with Bolivia, is the gateway to Lake Titicaca, one of Peru’s most popular traveller destinations. It’s the largest lake in South America and features the impressive floating reed islands. Although there are a few dozen other lakes in the world at higher altitudes, Lake Titicaca is larger and deeper, which is why it is often referred to as the highest navigable lake in the world. Located in the Nazca desert, the famous Nazca lines will fascinate. These ancient sketches, some of which date back to 200BC, range from simple designs to complex human and animal figures and geometric shapes. This World Heritage Site is best seen from the air, on a scenic flight, where you can discuss the different theories as to how and why these mysterious geoglyphs were created. Islas Ballestas and Paracas National Reservation offer one of the best wildlife experiences in Peru. This is the destination to head to, to see a wide array of marine life and wildlife such as dolphins, colonies of sea lions, lizards and varieties of sea birds. Also near the coast is Huacachina, a small town built around a lake in Peru’s desert. This oasis is a popular destination for adventurers and thrill seekers who take advantage of the massive sand dunes to go sand boarding and dune buggying. At Arequipa, three imposing and striking volcanoes majestically surround Peru’s second largest city. The city is devoid of any Inca ruins so the focus here is exploring its history, a mix of local and Spanish culture development. A short distance from Arequipa is another of Peru’s drawcards, the Colca Canyon, which is twice as deep as the Grand Canyon in the US. On offer here is hiking, hot springs, crafts and rock art. At Cruz del Condor you are able to see close up Peru’s national bird, the Andean Condor. Other wildlife includes deer, fox and a range of native South American animals. Lima, the Peruvian capital is brimming with cultural, historical and architectural attributes. It’s also dry, noisy and sprawling but this lends to its unique character. You will no doubt fly into Lima as your entry point to Peru, so spend a few days in this city, acclimatise to the infectious Latino vibe and start practicing some Spanish. Visit the many museums, monasteries, cathedrals or parks (Parque de la Reserva is one of the largest fountain parks in the world) and dive into some Peruvian cuisine at the Boulevard of Gastronomy. There is so much to see and discover in Peru: Inca ruins, world class cuisine, an abundance of wildlife and diverse landscapes from arid coast, to the spectacular Andes mountain range and the lush jungle of the Amazon. Peru offers travellers a diverse scenic and cultural experience… and certainly more than just one “bucket list” moment.